This is one of the main reasons why I consider eBooks over printed books sometimes. 😛 They have inbuilt dictionary and it’ll be very easy for me to understand the meaning of some complicated English words. Most of the popular eBook reader apps have this functionality. If you are a Mac OS X user, then you’ll have the same feel when you are reading articles online via your browser. 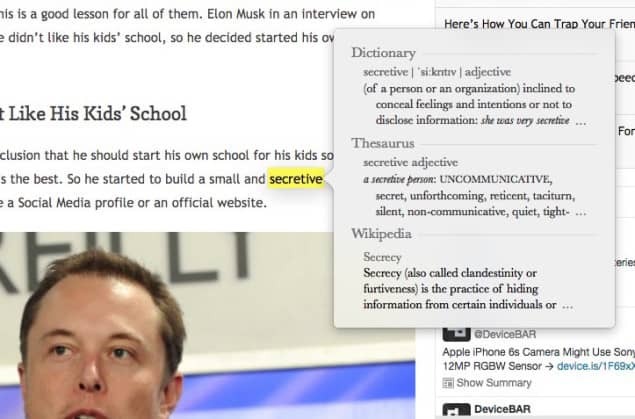 Yes, you can activate a small popup dictionary whenever you come across a complicated term. I used my favorite Elon Musk post for the demo. I browsed through the post, and I used the popup dictionary for the word ‘secretive’ (I love this word!) and you can see the results given by the dictionary. We have three sections: Dictionary, Thesaurus and Wikipedia. This is really handy and useful for me to check the meaning asap and proceed reading the blog post. You just need to hover your cursor over any word and hit the keys “Control + Command + D” to activate the popup dictionary. You don’t even need to select the word, just hover your cursor over that. You can also hover over the word and lightly tap three fingers on your trackpad. Both of them works and I prefer the trackpad method. I’m a big fan of Mac Keyboard Shortcuts, it helps me a lot to save time and make things easy. Which is your favorite Mac keyboard shortcut? Do let us know in the comments below.